Search the CFEMC mobile application on App Store or Google Play. The application is free to download and easy to use. We get it - you lead a busy life, one full of meetings, multi-tasking and precious few minutes to waste. You crave convenience and reliable service with one screen swipe. 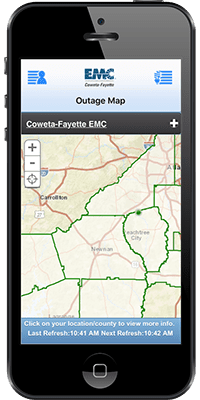 To give our members the ease and flexibility needed to manage full schedules and hectic days, Coweta-Fayette EMC offers a free smart app for iPad, iPhone and Android devices. With this user-friendly mobile app feature, consumers have fast, secure account access to view bills, make a payment, report and follow outages, schedule reminders, consult graphs and much, much more! 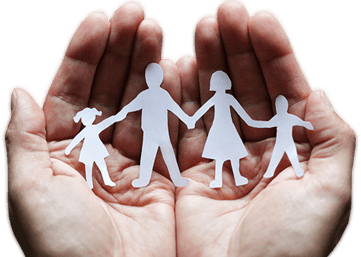 In fact, nearly everything Coweta-Fayetta EMC members currently do on their computers form our online "Customer portal" may now be handled instantly from home, work and everywhere in between. Using mobile devices take charge of your account on the go and even stay up-to-date on power interruptions. In the event of a storm that causes major outages, you can now log in to your smart phone or iPad, report the issue and monitor our progress on a mobile outage map. With all our app has to offer, what are you waiting for? Get started today to take advantage of Coweta-Fayette EMC's mobile services - YOU have the power! To find and download the app, you may simply visit the Apple App Store or Google Play Store and search for Coweta-Fayeete EMC or access those sites through our member portal. For more information, please call our customers service department at 770-502-0226.